Hey guys, just checking in. Today I finished chapter four of Repercussions, so I’m 25% of the way through it now. Jake and Lana from Travelers are included in this one, and there’s more focus on Martin and Dylan as well. The main crux of the story however will revolve around Billy, Sarah, Giles and Sav. I haven’t gotten to that part yet, though I’ve had one little tease leading up to it. There’s also a surprise appearance by an old enemy they vanquished over two-hundred years ago that has them all incredibly worried. There’s this absolutely wonderful girl named Amber who’s become very special to me in the time since I first met her. She’s currently reading the series, and I’ve been talking to her a lot on Facebook. Her job is kind of annoying sometimes, so to entertain her I’ll talk as the characters now and then just to put a smile on her face. However, one day I decided to do something a little bit different. I had her pick a gender and a specific age range as the basis for a character, and then I proceeded to create a story based around that character. Now, not to blow my own horn or anything, but I’m really good at doing stuff like that, and what came out of it was the foundation for an entirely new story that could potentially turn into a series that’s completely unrelated to the Unseen Things series. This new story would revolve around a girl who ends up working as an assistant to a private investigator, and that would eventually lead them into a case that had paranormal aspects to it. I don’t know where it’ll take me since I let the writing go wherever it feels like it should, but I’m really excited about turning that into something. I may do that after I finish Repercussions, just so I can have a little break from the series to recharge my batteries a bit. I’ll see what mood I’m in when I finish writing Repercussions. Anyway, that’s it for now. I’ll post another update when I have more to report. My wife was reading Transition and caught a small mistake that I’ve now corrected. The fixed copies of the book have been uploaded to the various sites. The mistake was in chapter 8 when Chris refers to his late wife Janet. Her name is actually Lisa. I’m not sure where Janet came from or why the hell I would have typed that name in the first place, but unfortunately I didn’t catch it while I was editing. So if you have a copy without the fix, just mentally insert the name Lisa over Janet, or refresh your copy of the book from the retail site you bought it from. Sorry about not catching that during the editing process, but I’m only human. Work has begun on book 18, Repercussions! Last night I started working on book 18 of the series, Repercussions. The opening scene so far has been quite fun and even includes a visit from Jake and Lana. I probably won’t be revisiting the other characters from Travelers other than to mention them once in a while in passing, but Jake and Lana will definitely be making appearances every now and then. I may even make them more a part of things as the story progresses just because I love the characters. I’ll have to see how it all plays out as I write. I had a hell of a time coming up with a cover for this one. The concept of the story doesn’t really lend itself to a cover, but I finally came up with a really sweet looking one that I’m totally happy with. I always do the cover and other graphics before I start writing the story. It’s all just a part of the process. I have to do the cover first. Call it a personality quirk or whatever, but that’s just the way I am. 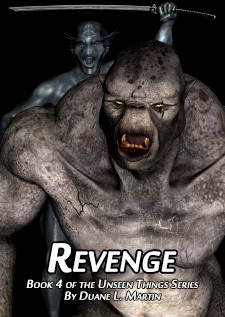 I’ve just finished editing and publishing a new version of book 4 of the series, Revenge. I thought I hadn’t edited it properly, but now I’ve come to realize that I did edit it, but somehow when I published it originally, I published an unedited version of the book. I wasn’t able to located the edited copy, so I’ve completely re-edited it from scratch and re-published it with a new cover (pictured here) to replace the old one, which I was never all that happy with. What’s new in the re-edit? About eight-thousand words, that’s what. The re-edit is up to my current standards, and I’ve made a few small modifications to the story to make it jive with what comes later. Consider this a second edition, even though I’m not actually calling it that. Now, for anyone who bought the unedited version of the book prior to June 2, 2015, I’m going to take care of you and make sure you get an updated and finalized copy. Just send me a screenshot showing that you purchased the original copy, and I’ll send you the new version in your choice of formats for free. You can contact me through the contact page here on the site. I’m very embarrassed about this happening, but it’s all been rectified now.